Designed from the ground up to integrate into your existing website. 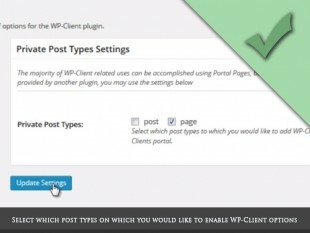 WP-Client uses a combination of shortcodes & your existing theme. A private portal & login are created for each client automatically, and all components & files are only accessible by you & your client(s). Create customized & branded Estimates & Invoices that can be viewed/paid online, or send via email attached as a PDF. Assign each Client to their own Client Manager & funnel information exchanges to the proper place in your organization. Complete set of documented hooks that allow developers to customize and integrate WP-Client to fit their needs. Private messages with clients from client portal are emailed to the proper contact. A chained record of messages is kept for clarity. 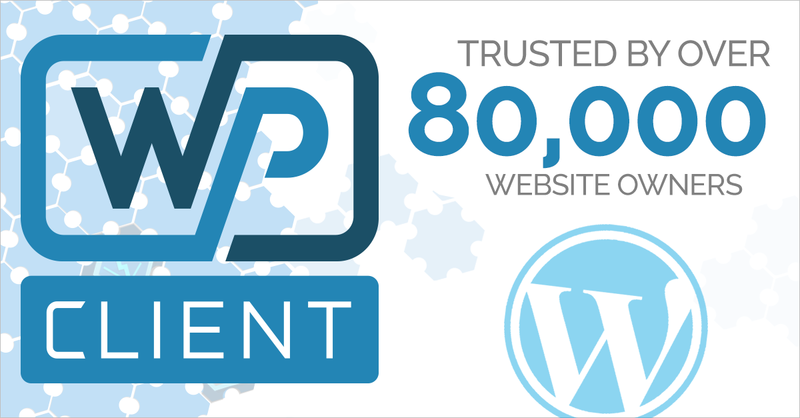 With multiple pricing levels available, WP-Client is the perfect solution for any business requiring a complete and professional Client Management Framework. 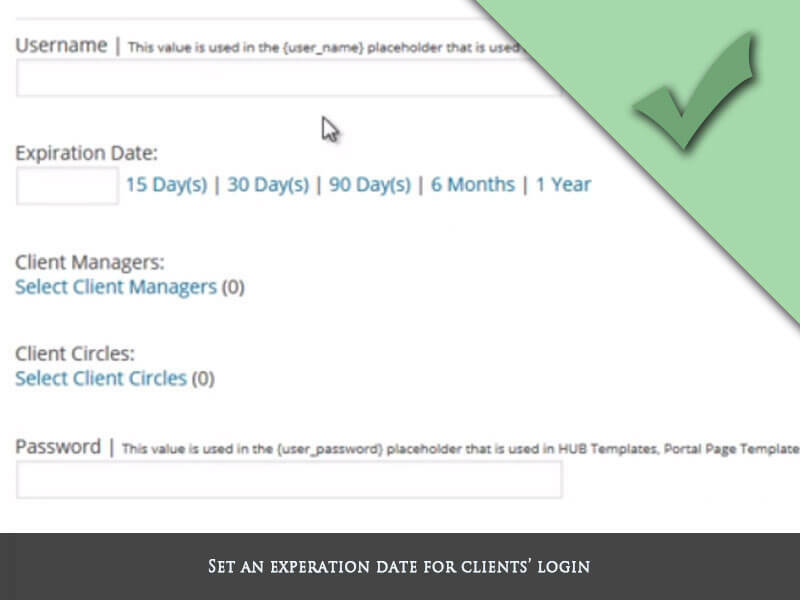 Click for Video –When you add a client, you create a private client login and that client’s username/password, along with the login link are emailed directly to the client. The client logs in via a login page that you can customize with your logo & colors. 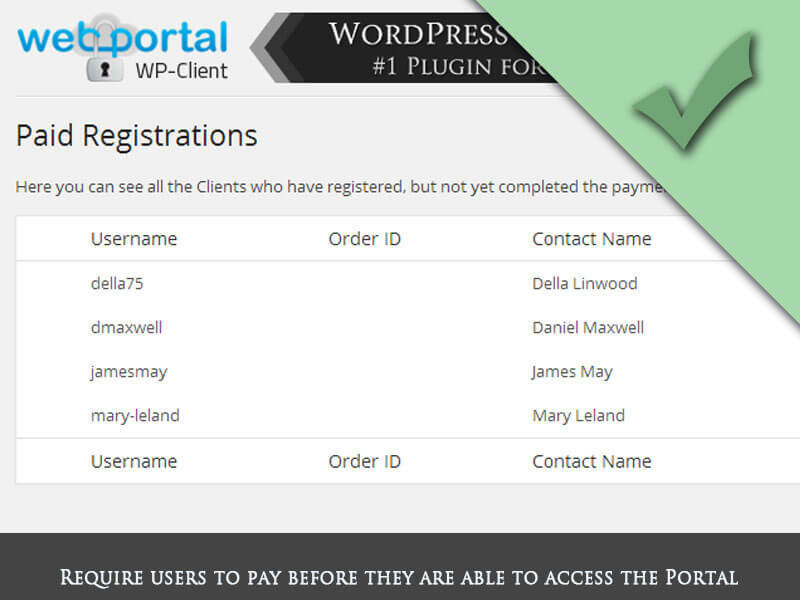 You can also use any page on your site as the login page by inserting a login form shortcode provided by the plugin. 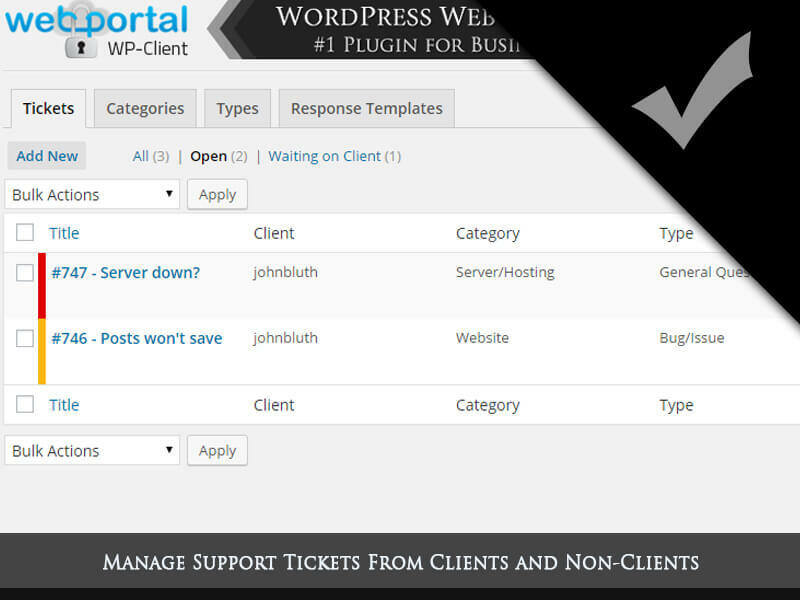 Alternatively, WP-Client ships with a custom login widget that can be used in the sidebar or any widget area provided by your theme. Navigate to all the private pages that exist in their portal. 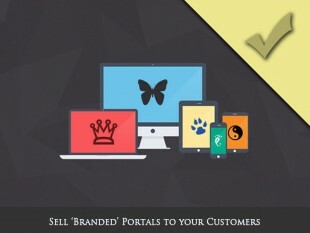 These Portal Pages are where most of the web-like content of the Portal should be housed. 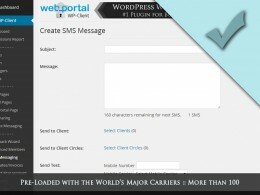 Send/Receive Private Messages to/from the Site Admin, WPC Admin or their Client Manager. Email notifications are triggered when PMs are sent. Clients can view/edit their profile information on the front end (optional) – All of this happens without them seeing the WordPress dashboard. Clients can change/reset their password on the front end (optional) – All of this happens without them seeing the WordPress dashboard. Do you have existing WordPress pages or blog posts that you would like to incorporate inside your Portals? No problem. You can easily use our Private Post Types feature to assign them to individual Client, multiple Clients, and/or Client Circles. This can also be accomplished with custom post types belonging to other plugins. Create a variety of custom HUB page templates and assign them to specific Client(s) or Circle(s) depending on your needs. This feature gives you the power and flexibility to ‘Pre-Create’ your user’s experience. Then, when adding Users, you decide what they will see by assigning them to the correct Circle. 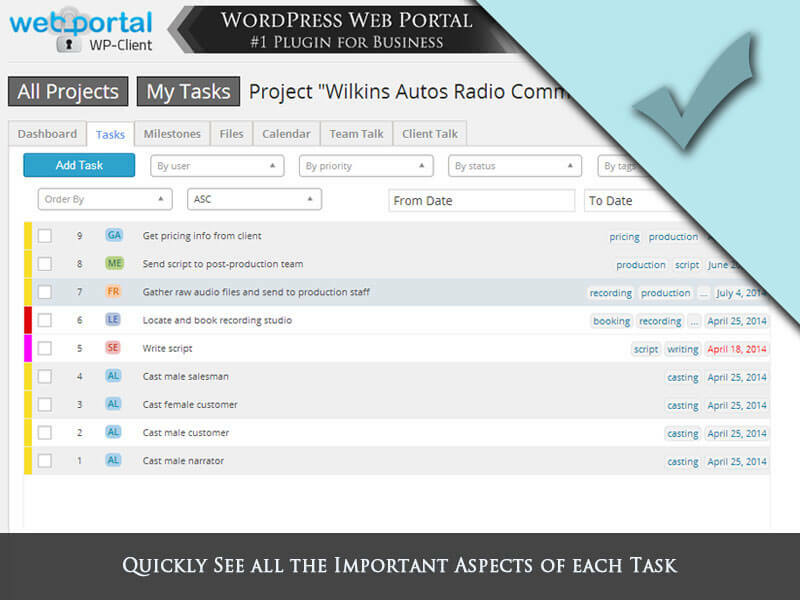 Powerful Widget Control lets you decide which widgets will be displayed on your HUB pages and Portal Pages. Click for Video –Easily allows the site owner to manually create clients by completing just a few data fields. Convert existing Users to work with WP-Client using a unique approach that essentially permits users to keep both their existing role while also adding the characteristics and permissions of their WP-Client role as well. Import your Client Base, and each one’s HUB and Portal Pages are instantly created according to your preferences. Click for Video –Custom fields lets you completely control what type of data you can record for each client, enabling you to collect information that is applicable to your business. Need to know your Client’s VAT number, Industry Parts Code, Pet’s Name, Favorite Color, or some other info that’s proprietary in your business? No problem! 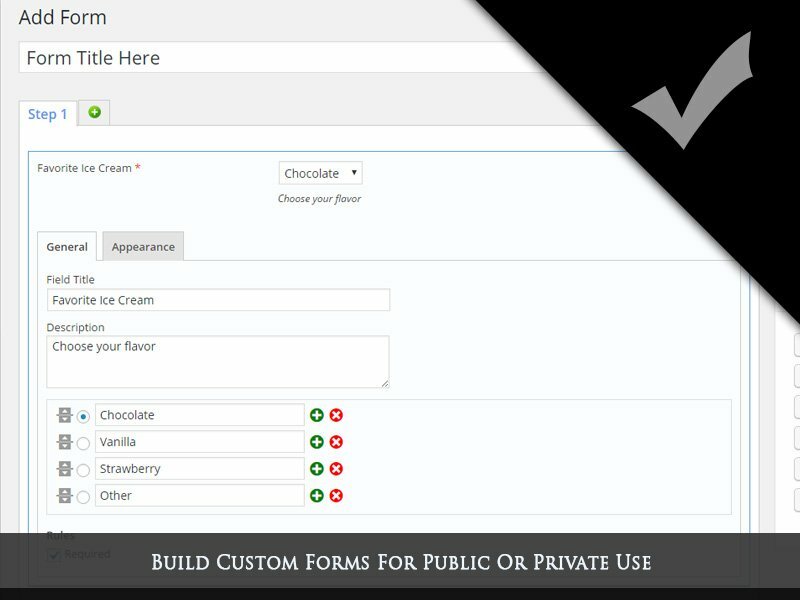 Click for Video –Optionally enable a Client Registration page, and permit users to register themselves by completing the customizable form. Site Manager has the option of manually approving each Client or setting the process to Auto-Approve. You can optionally configure the registration process to require payment before the user can access their Private Portal. 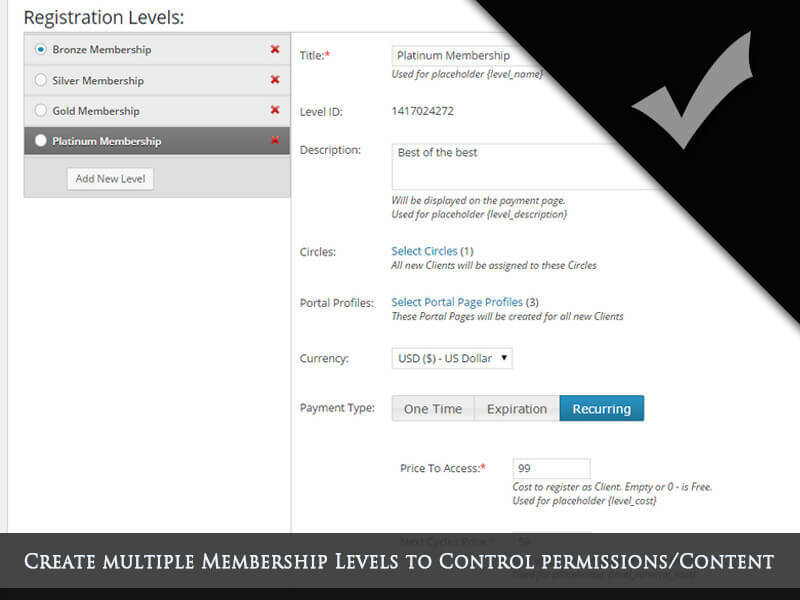 User simply fills out your customized registration form, and is then give a choice of payment gateways. Payment is verified before granting access to that user. Upon approval, whether manually,by auto-approve, or by automated approval of payment, the HUB and Portal Pages for that new Client are automatically created according to the easily customized templates, and the New Client email is sent. Now, you can use the templates to ‘pre-build’ the Portals, and then as Clients are created, those Portals are instantly created according to your preferences. Admin Manager feature allow the site owner to designate a “manager” for each client that is added. All communications and file uploads associated with that client will be directed to the appropriate client manager. The WP-Client Admin role allows you to give the management of the WP-Client plugin to a member of your staff without granting full WordPress Admin rights. 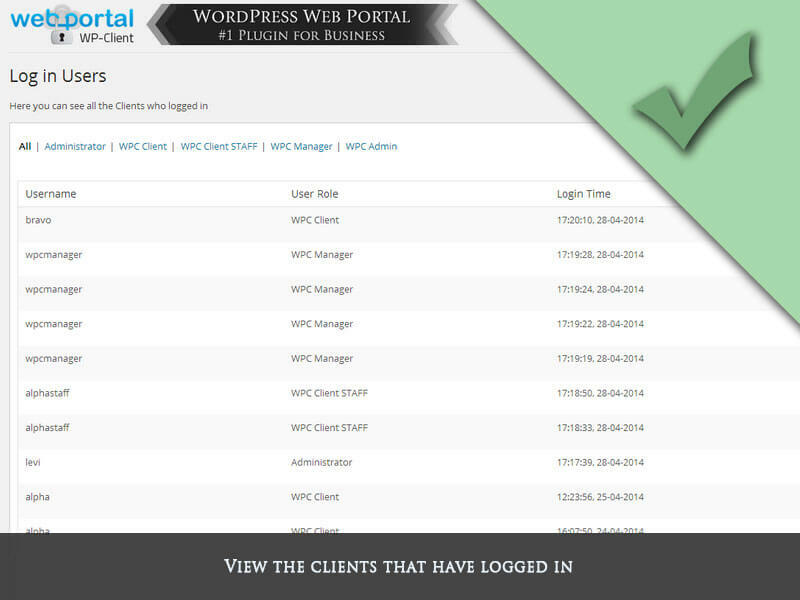 That person will only be able to see/manage the WP-Client menu when they login to the Dashboard. Optional Double Opt In Registration. Email Verification feature lets you restrict Client access to their Portal until they have clicked the verification link in the auto-generated registration email. Terms & Conditions Option lets you require users to agree to your legal requirements before accessing their Portal. Enhanced Security features let you set your requirements for your User’s passwords. Require a minimum password length, special characters, etc… You can even ‘blacklist’ common weak passwords to prevent their use. IP restriction Feature allows you to further secure your Web Portal by setting ‘whitelisted’ IP addresses after which only users from those IP addresses will be able to login. Hide/mask the default WordPress login URL ( /wp-admin ) and replace with your own custom login suffix. This not only hides the login from humans, but also from ‘brute force’ attacks that are commonly used to hack WordPress websites. Click for Video –Site Manager can easily upload files of all types, then categorize, assign permissions and configure for download all within one operation. Links to those files, along with the date uploaded & file size then instantly appear in the HUB of all Clients who are assigned permissions. Extreme flexibility that lets you assign permissions for each file to just one Client, several Clients, many Clients or every Client. BYPASS typical difficulties with uploading large files using our uberLOADER which enables ‘file chunking’ and has been shown to upload files of over 1 GB in size. FTP Sync feature allows you to easily FTP files to your server and have them automatically be permissioned to the correct Client or Clients. Sync can set to manual or automatic. File categorization is very intuitive and allows you to place files in categories and even sub-categories. Files can be viewed by the Client in your choice of formats, including a table, file tree or a simple list. Grouping your Clients into logical Circles gives you to the power to assign permissions for a file to every member of that Circle with just one click, thus saving the site Manager invaluable time and effort. Access to files is strictly controlled by the database. Files uploaded via the WP-Client interface are held in a secure and protected folder, and are only called by the database when a properly logged in client is logged into the browser. Files are never accessible by direct URL path. Clients can upload files to the Site Manager, triggering an alert email to the Site Manager or assigned Client Manager. Site Manager then has the option to share that file with other Clients if that is appropriate. 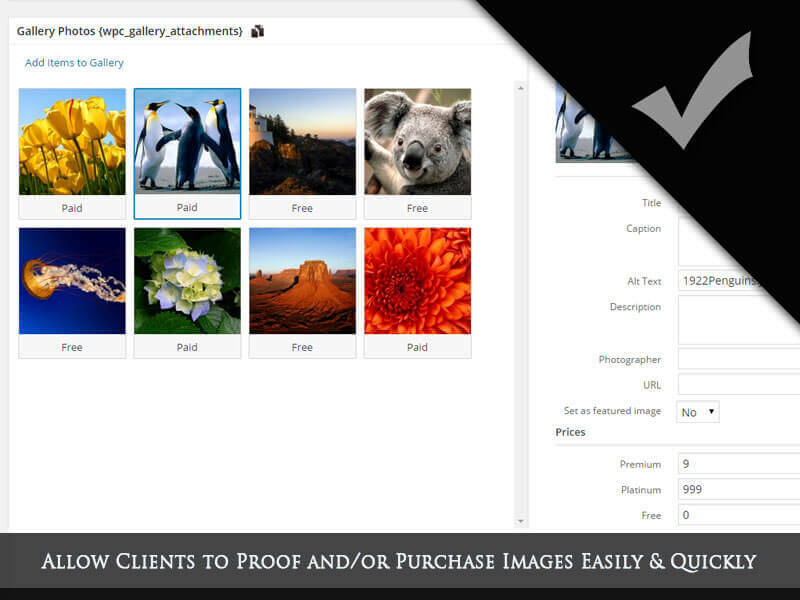 Files that the Client uploads are also visible and available on that Client’s HUB. Blacklist feature allows you to control what types of files Clients can upload to your server. Full featured Estimates & Invoicing feature, complete with ability to Pay Online using your choice of available gateways. Create one-time Invoices or create Recurring Invoice profiles which auto-generate a new invoice according to your preferences. Every week, every month, or however you decide! Pre-create often used billable items to help you quickly create Estimates & Invoices that contain frequently used/repeated items. Create an Estimate for the work. When approved, convert to an Invoice and email to client(s) in one click. 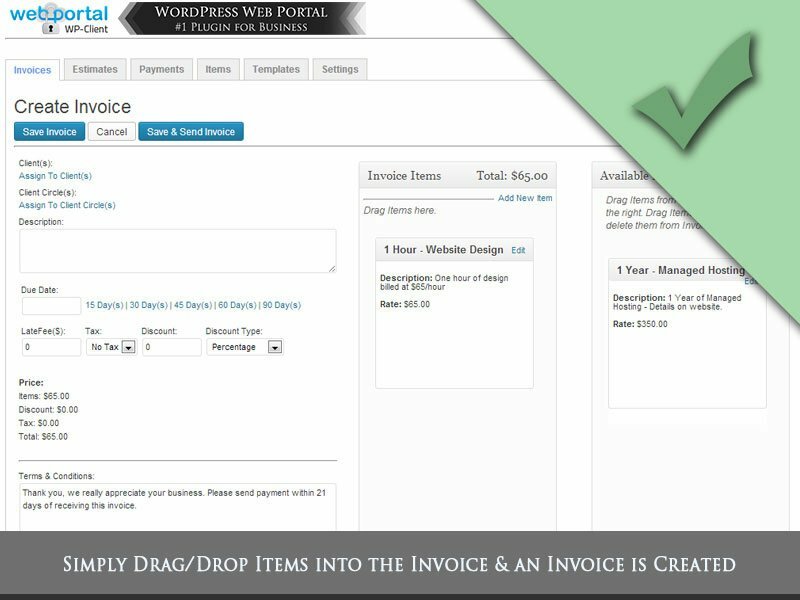 You can create one Estimate/Invoice and assign to multiple clients. When you click the “Create” trigger, a unique duplicate Estimate/Invoice is created for each individual Client so that each has a unique Invoice to pay. Powerful and efficient mass creation of Estimates/Invoices. Estimate & Invoice templates are fully customizable with your logo and layout of your preference. 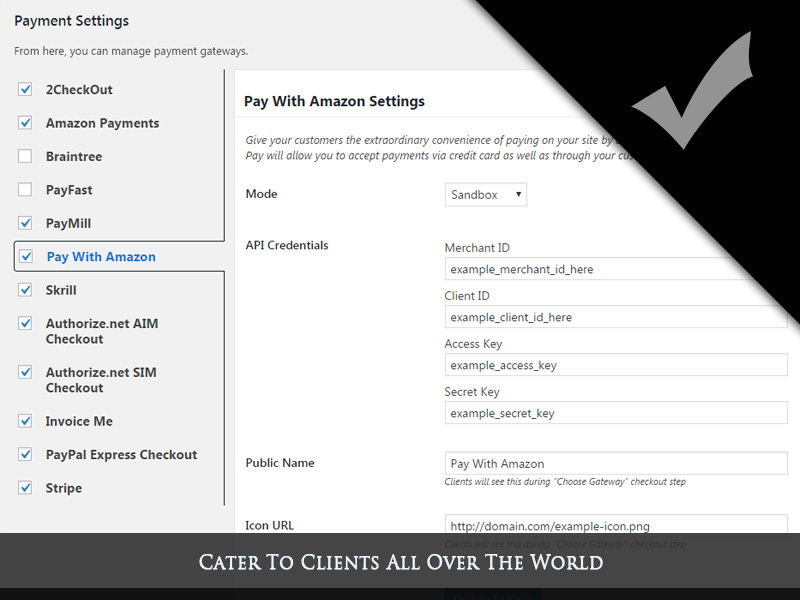 Supports Partial Payments so that your Clients can pay a bit at a time. You can also set a minimum amount for partial payments. Supports IPN to confirm and mark Invoices as paid. Also, optionally triggers a thank you email to the client, thanking them for the payment. 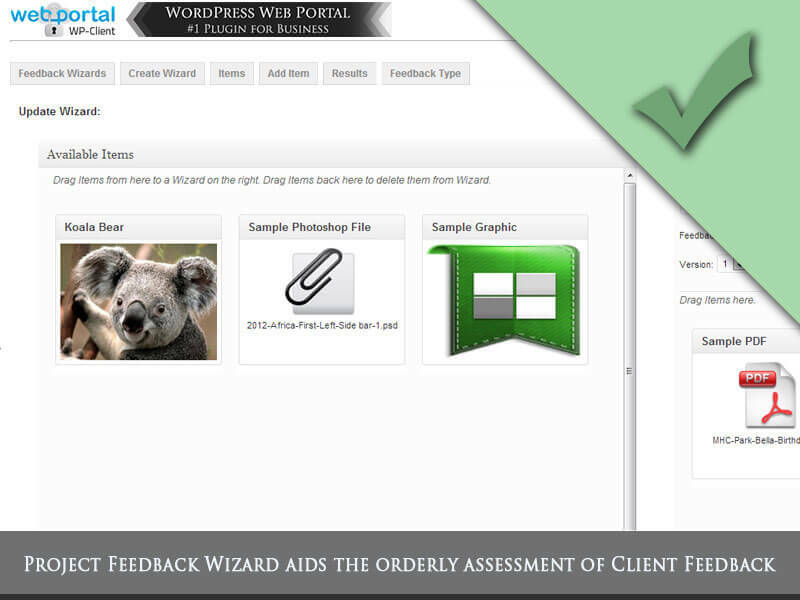 Presented in a Wizard style format, the client simply moves from one slide to the next slide to the next slide providing feedback according to the Site Manager’s preferences. The actual voting choices can be customized, and the client can leave full paragraph comments about each slide. Upon final submission, the results are stored in the database, and emailed to both the admin/manager and the client. 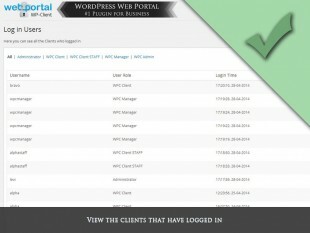 The results can be viewed at any time in the admin console of WP-Client. 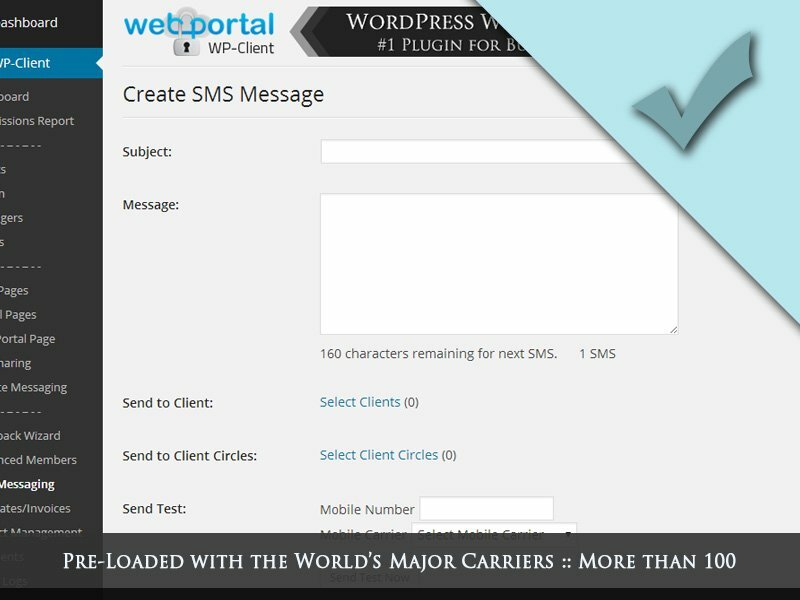 All WP-Client components, including Portal Pages & emails are 100% customizable to help you match your company’s brand and image. Your Client’s will feel they are being catered to in a professional and secure way, and your brand will be reinforced throughout. 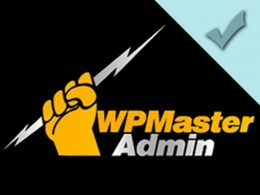 Create a “WP-Client Admin” which is a user who only has permissions to manage the features of WP-Client. 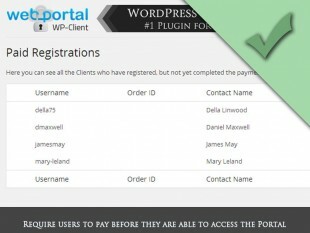 This user does not have full-blown admin access to the WordPress install, but does have full control over the WP-Client settings. Client Login Alerts send the Site Manager a notification when a Client either successfully logs in or experiences a login failure, thus giving you the heads up that either your Clients are successfully accessing their Portals, or are having trouble. In the case they’re having trouble, you’ll look like Johnny-on-the-spot when you contact them to offer help. They will wonder how you knew they were having trouble, and be impressed by the high level of Client support. Give Clients the power to add logins for their Staff, thus allowing the necessary people in that organization to view the Portal, but with unique login credentials. This provides for insularity and permissions control in cases where logins must be deleted or restricted. Built in SMTP routing gives you the option of using services like SendGrid or Mandrill to increase the likelihood that notifications sent from your site will end up in your target’s inbox rather than the spam box. 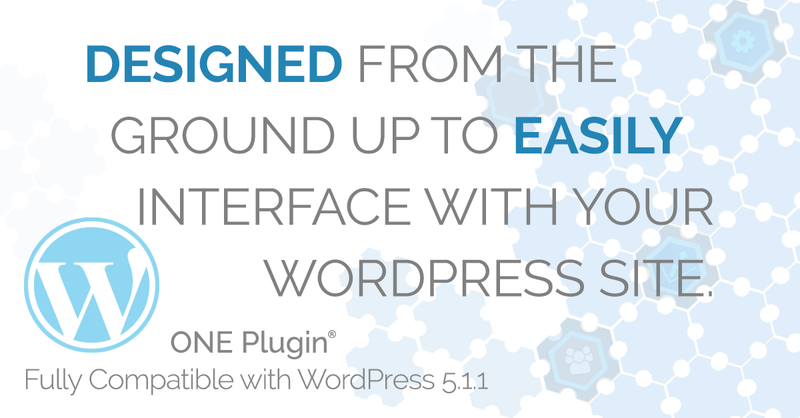 Updates to the CORE plugin and Extensions are made automatically via the WordPress updates process. No complicated updating process means it’s always easy for you to stay up to date with just a few clicks. Many more… Click “Detailed Features” below for more. Authentic Testimonials from Actual Customers – No Fluff, No B.S. Remarkable. All is working. I’m amazed at how fast you guys are in responding and the thoroughness of the help instructions. Great job. And thanks a million for making such an awesome plugin. This was exactly what I was looking for and you’ve even added invoicing to it. We’re using the plugin to post invoices & project results for our clients, and they have almost all commented on how they like being able to securely access this info at anytime. It makes us look more professional, and it was really pretty easy to modify the colors and logos to match our website. Good show mates. I’ve been looking for this exact functionality for so long, finally came across your plugin, and what a pleasant surprise! Really love the whole concept behind the plugin, and how it makes everything so flexible. Use of shortcodes is clever and makes integration a snap. I would like to tell you about how your plugin has transformed my Thai language school. My wife and I have developed a complete solution to help learners of Thai language. We provide learners and teachers the materials they need to either learn or teach Thai. We wanted our students and teachers to access and download stages of learning materials as they progress through their learning experience. WP-Client has given us the ability to provide a personal learning space where our clients can practice new language skills online and access everything they need to learn. 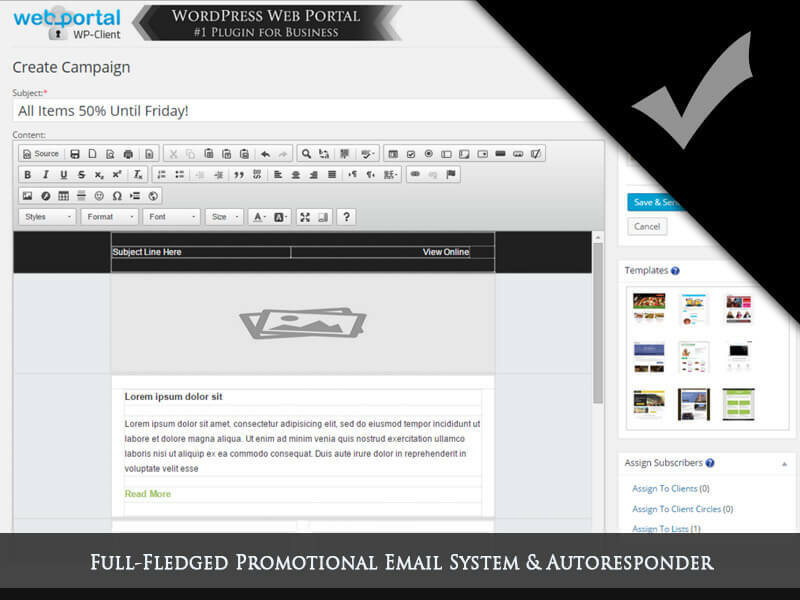 WP-Client has given us the flexibly we needed to provide this solution in a very professional and simple way. We have only been using WP-Client for about 2 months but we already have more than 150 clients using our online learning space. The plugin has saved us time, money and allows us to get a new student or teacher setup within minutes so they have instant access to their learning materials. The system allows selected users access to our valuable materials where we can monitor usage with successful login emails and we know where clients login with their IP address. WP-Client has transformed the way we work and is helping hundreds of people learn Thai language. I’m a freelance web designer and developer. 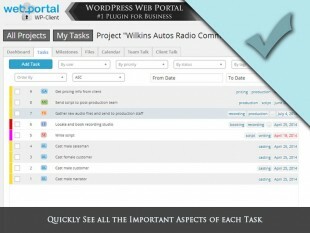 WP-Client allows me to communicate in a secure, centralized portal with my clients so I can offer the highest quality of service to them and stay organized. Presenting design drafts or logo concepts to my clients within the WP-Client Hub Pages is a great way of customizing their user experience and delivering a product in a convenient way. Many of my clients have commented on the level of professionalism that comes with being provided with a unique, custom portal for their project. It’s a great product! I bought 2 copies of this [plugin] and I’m very impressed! I’m a professional photographer and visual designer, and I use this plug in for my studio and for clients than need a professional solution for show the pictures to clients. Thank you WP-Client! I’m really really happy! Great product! I would highly recommend WP-Client. I love the plug-in and I only had great experience with WP-Client. Their support team is fantastic and I mainly worked with Mike who from the beginning helped me in any way he could. He is very professional, very patient and he explains everything in detail. It is really great working with him; he is awesome. I am so happy that I found WP-Client and I thank you for such great customer service and a great product! I am a very happy and satisfied customer and I will recommend you at anytime. Thank you very much!